After recording 18 consecutive months of decline, inflation in Nigeria has taken a growth path, which is not to the benefit of the public, especially as prices of food items rise, with potential hunger and malnutrition as the outcomes. A report by The World Poverty Clock released sometime in June 2018 showed Nigeria had overtaken India as the country with the most extreme poor people in the world. According to the report, the 86.9 million Nigerians living in extreme poverty as at the time it was published, represented nearly 50 per cent of its estimated 180 million population. "As Nigeria faces a major population boom--it will become the world's third largest country by 2050, its problem will likely worsen. But having large swathes of people still living in extreme poverty is an Africa-wide problem," the report noted. Economic experts believe that the struggle to lift more citizens out of extreme poverty is an indictment on successive Nigerian governments that have mismanaged the country's vast oil wealth through incompetence and corruption, one of the reasons why they said it was practically impossible for the country to meet The United Nations' Sustainable Development Goal (SDG) to end extreme poverty by 2030. Contrary to the projection of the United Nations that by July 2018, 83 million people would have been lifted out of extreme poverty since January 2016, the number was 37 million people fewer than the required to meet the 2030 target. The chance of about half the population of the country escaping the threshold of extreme poverty, as anticipated by the United Nations by 2030, is becoming slimmer as inflation has taken a negative twist with the election year approaching. At least in the last two months, core inflation has increased from 11.23 percent to 11.28 per cent as of September, 2018. This has brought to an end, albeit, the 18 consecutive months decline that inflation recorded from about 17.78 percent in February 2017 to 11.14 percent in July 2018. The consumer price index (CPI) measures the average change in prices of goods and services consumed by people for day-to-day living over time. The change is about 0.05 percent points higher than the rate recorded in August 2018. The latest inflation report from the NBS showed food inflation, on a year-on-year basis, increased further from 13.16 per cent in August to 13.31 per cent. The government data bureau said the rise in the food index was caused by increases in prices of food items such as potatoes, yams and other tubers, vegetables, fruits, meat, milk, cheese and egg, bread and cereals, and fish. Howbeit, housing and utility prices dropped from 7.27 percent in the previous month to 7.25 percent during the months under review. Other details included an increase in basic human needs like education and health. NBS disclosed that education price moved up from 9.83 per cent in August to about 9.92 per cent in September, while health increased marginally to 9.65 percent compared to 9.64 per cent in the previous month. In the service industry, prices of services offered in restaurants & hotels increased from 9.38 per cent in August to 9.39 per cent in September, while cost of communication moved up 0.47 basis points to 6.79 per cent from 6.32 per cent. Meanwhile, other costs dropped in respect of clothing and footwear (10.03 percent against10.20 percent in August); transport (10.50 percent from10.65 percent); furnishings & household equipment maintenance (9.79 percent from 10.07 percent) and miscellaneous goods and services (9.85 percent from 10.03 percent). Although the NBS said inflation was steady at 8.32 per cent for recreation and culture, it said "all items less farm produce" or annual core inflation, which excludes the price of volatile agricultural products, declined to 9.84 percent in September from 10.02 percent in the previous month. The highest increases were recorded in prices of fuels and lubricants for personal transport, vehicle spare parts, dental services, tobacco, carpets, and other floor coverings, furniture, and furnishing, Hospital services. The statistics agency said latest increases affected all 12 classification of individual consumption by Purpose (COICOP) divisions and all items levels, which yielded the headline index. The 12 COICOP divisions included food and non-alcoholic beverages; alcoholic beverages, tobacco, and kola; clothing and footwear; housing, water, electricity, gas; furnishings, household equipment; health; transport; communication; recreation and culture; education; restaurants and hotels as well as miscellaneous goods and services. The annual urban inflation rate rose by 11.7 per cent during the month, from 11.67 per cent in August 2018, while the rural inflation rate increased by 10.92 per cent in September 2018 from 10.84 per cent in August 2018. The prospects of growth for the Nigerian economy is not bright as GDP growth has been downgraded from 2.1 percent to 1.9 per cent by the World Bank as well as a few other economic analysts. According to Cordros Capital, "we cut our growth estimate for financial year 2018 to 1.9 per cent year on year, driven by slower-than-previously expected oil sector growth, flood-induced cutback in Agriculture output, and the absence of structural reforms to propel sturdy manufacturing sector growth even as the FX market remains stable". Cordros attributed the resumed uptick of inflation in August to wane in base effect induced gains in the economy. It also added that the year-on-year upward movement of inflation will be sustained till the end of the year. "With the gains from base effect already dissipated, together with our expected higher month on month (m/m) inflation over fourth quarter (Q4, 18) compared to 2017, we expect the year-on-year headline CPI to sustain upward trajectory through the rest of the year." To ameliorate the suffering of Nigerians, experts recommend the Monetary Policy Committee (MPC) of the Central Bank of Nigeria must maintain status quo on monetary policy and desist from hiking rate. Besides, it is expected that the CBN must manage inflation by mopping up excess liquidity in the system. "On monetary policy, we reiterate that we do not expect the Committee to hike rate in the next policy meeting, given the still fragile economic growth. However, we believe its hawkish rendition will reflect in OMO issuances through the rest of the year, as sustained foreign sell-offs of naira assets drives pent up demand for FX, with the CBN stepping up paper issuances to arrest speculative tendencies on the naira." 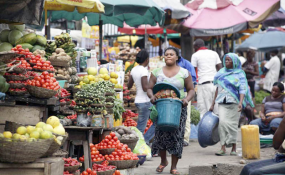 A research analyst at SY&T Communications Limited, Lukman Otunuga, says the new inflation figure is still in line with the federal government's target of a single digit rate in the foreseeable future. According to Otunuga, most investors in the Nigerian stock market were concerned that the latest rise in inflation was not the onset of another round of inflationary pressures in the country during the final trading quarter of the year. He, however, said concerns might heighten over inflation edging away from the Central Bank of Nigeria (CBN)'s target of six to nine percent. As far as Otunuga is concerned, market expectations were for a cut, any moment, in the monetary policy rate (MPR), the benchmark interest rate, by MPC of the CBN. "The combination of rising inflation, uncertainty ahead of the 2019 elections, global trade tensions and U.S. rate hike expectations are all likely factors to force the CBN to retain status quo (in the MPR) this quarter," Otunuga noted. Meanwhile, researchers at Cordros Capital said the impact of inflation on Nigerians will only be stemmed down in the short term, noting that the effect will continue in the long run. "Into the rest of the year, we expect the on-going main harvest in the North and South to further exert downward pressure on food prices as supplies continue to flood the market. However, we expect the foregoing will be limited by the widespread flooding incidence reported across food producing states. Elsewhere, in the face of increasing energy prices, we believe the NNPC will remain committed towards strategic supply of petroleum products to steer clear of fuel shortages, with the attendant impact leaving core inflation in check. Hence, we forecast month-on-month headline reading of 0.80 per cent for October, with the corresponding y/y reading of 11.33 per cent (December 2018: 11.52 per cent y/y)."